Fala Chen is currently studying in the US. 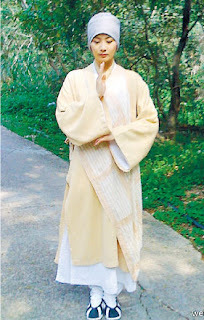 Yesterday morning she suddenly posted a photo of her dressed like a Buddhist nun and created a beautiful misunderstanding. A fan thought she turned to become a nun and left a message expressing their fear and how unbelievable it is. Many other fans believed the photo is from a series. Fala later expressed she was very pleased to hear her professor complimenting on how hardworking she was and was touched by a written piece, making her feel so minute. She said: "Today my professor complimented that I'm an extremely hardworking student. I'm still feeling happy. Then I saw a written piece that left me in tears. It was as follows: 'There are four states in success: small success rely on diligence, middle success rely on wisdom, big success rely on virtue and eventually becomes a road.' It turns out, I spent half a day and I'm still a 'small Chan'."